Finally, my favorite season of the year has arrived! In honor of this momentous moment, I offer you a few photos I took yesterday afternoon when the sun appeared after days of clouds. This is the season of fruits and nuts (I refer to botany, not humanity), so that’s mostly what you’ll see here. 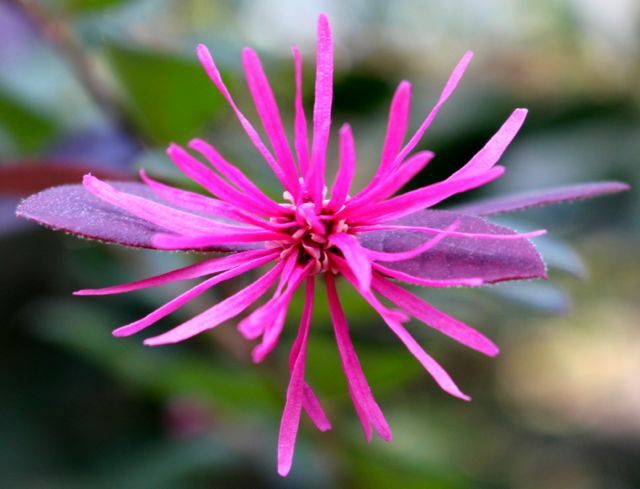 If this gorgeous native is not yet part of your landscape, consider planting one this fall. And I know just the place you can pick one up the weekend-after-next. I won this pink-berried form in a raffle when I was going through Green Gardener training at the NC Botanical Garden — yet another benefit of volunteering there. 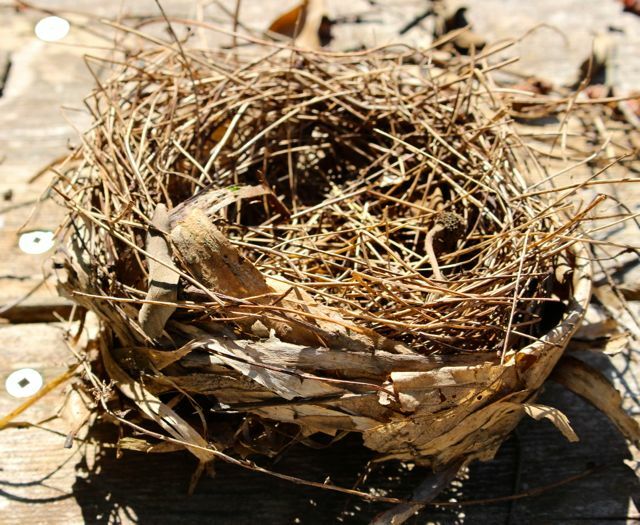 This delicate nest woven of bark strips and pine needles fell from my evergreen Kousa dogwood. Very autumnal, don’t you think? The hearts are a’busting all over my Euonymus americanus. 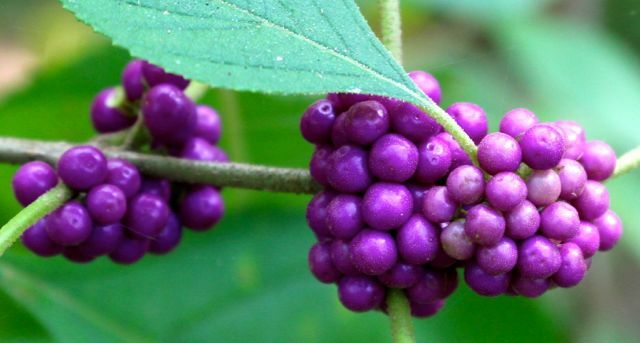 This is another lovely native shrub that will be available at the NC Botanical Garden’s upcoming Fall Plant Sale, but only plant it if you have a spot where deer can’t reach it. The evergreen stems of this beauty make it irresistible to them during food-scarce winter months. 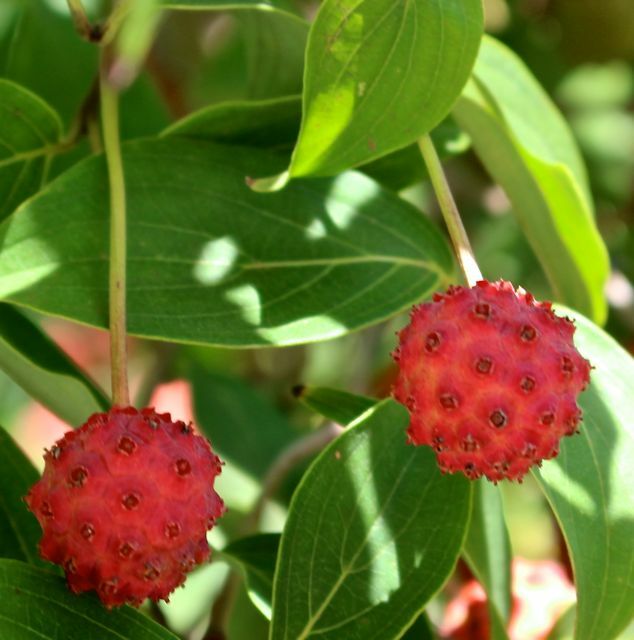 The Asian Kousa dogwoods are not native, but I’ve seen no signs they are invasive, and their wow factor in the landscape is undeniable. 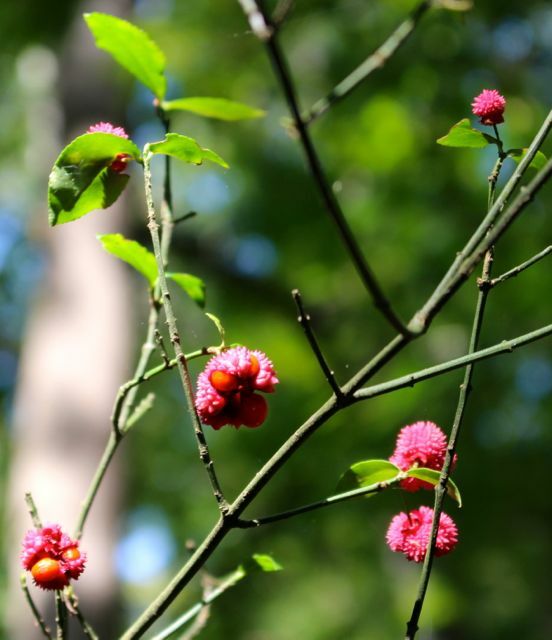 The berries of my native dogwoods are already nearly gone, thanks to the Pileated Woodpeckers, which have been partying in those trees for several weeks now. The red globes produced by the Kousas don’t seem to appeal to as many birds, although I’ve seen Northern Cardinals enjoying them. Squirrels seem to like them quite a bit. 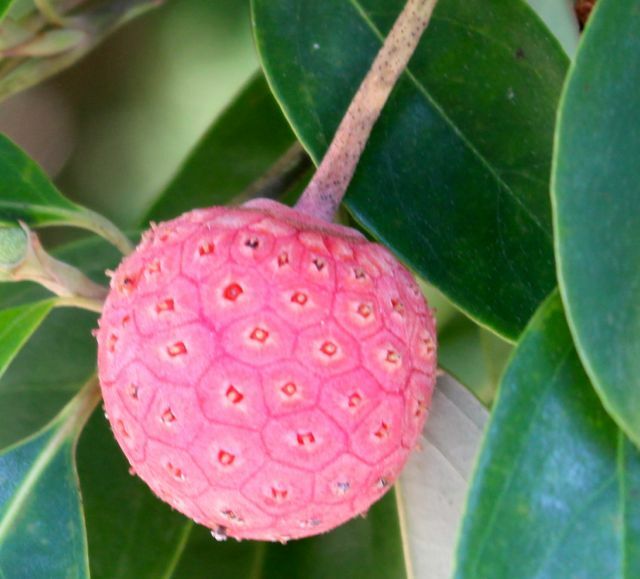 Most interesting to me are the subtle differences in the fruits of my deciduous Kousa dogwood and the evergreen Kousa. See for yourselves. 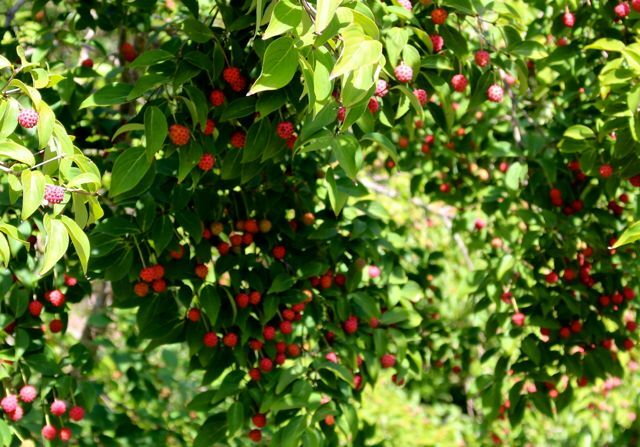 The fruits of the evergreen form never look as “spiky” as those of the deciduous Kousa. And they are never as deeply red. My Red Buckeye is loaded down, as usual. 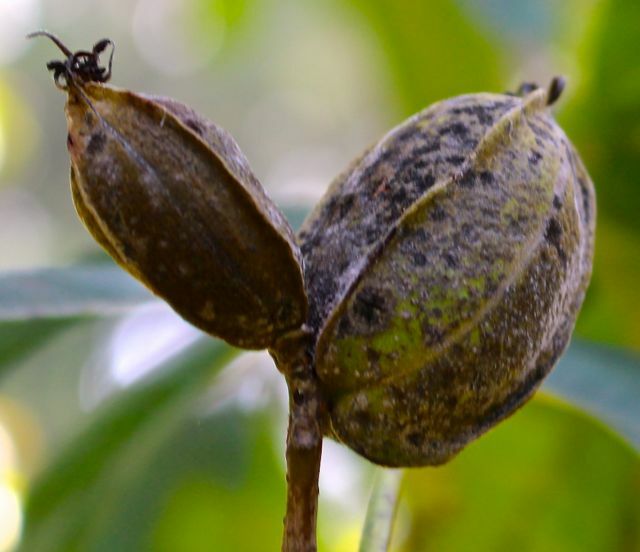 The pecan trees had a rough summer. It was just too dry, and there’s no way I can water them. Still, they managed to produce a few, rather unappetizing-looking nuts. The squirrels will no doubt try them before long. The native Swamp Milkweed and Butterfly Weed seed pods continue to develop. You can pick these up at the NC Botanical Garden Fall Plant Sale too. Not autumnal, but too pretty to ignore, my giant non-native Loropetalums are pushing out quite a number of flowers, even though they’re supposed to bloom in the spring. They do this almost every year, and it doesn’t seem to prevent them from doing it again when they’re supposed to bloom. 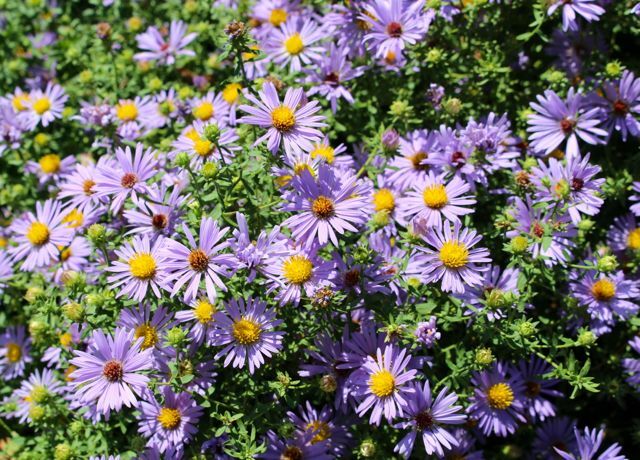 I love the contrast with their lovely purple leaves — the reasons these non-natives made it into my garden. 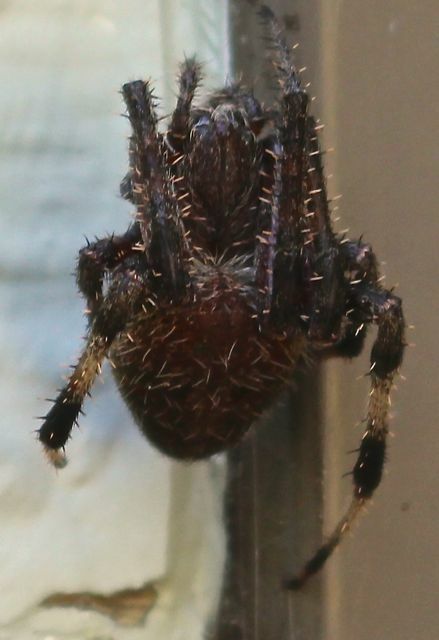 This species of orb weaver moves in multitudes to my windows — on the outside — every fall. This one is pretending it’s not a spider, because I disturbed it. They grow fat off the moths attracted to the lights in our windows every night. Of course, I can’t end a post welcoming fall without showing a few colorful fallen leaves. These are off one of my native Black Gums, which always color up early and spectacularly. 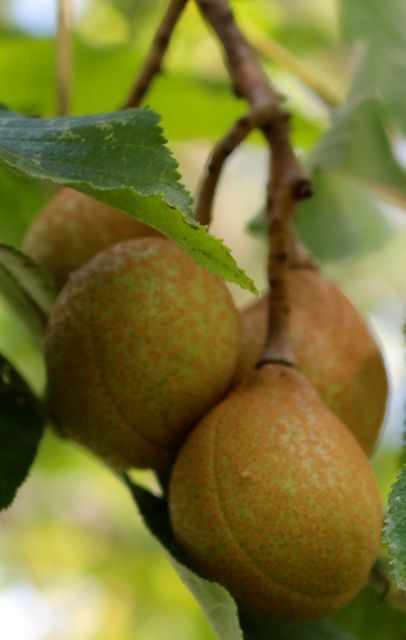 This magnificent native tree will also be available at the NC Botanical Garden Fall Plant Sale. 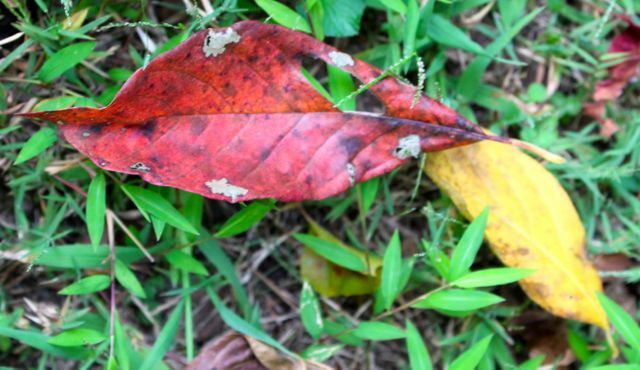 I hope this post helps all my readers celebrate autumn’s arrival, and gets your fingers itching to plant some new native beauties in the cooling, moist soils of the season. So gather ye pumpkins while ye may — and add some new natives while you’re at it. This entry was posted on September 23, 2015, 7:29 am and is filed under Favorite Plants, Native Wildlife, piedmont gardening. You can follow any responses to this entry through RSS 2.0. You can skip to the end and leave a response. Pinging is currently not allowed.